Photo: Mark EwingOver the last two issues, I've been taking a close look at Korg's Legacy Collection, specifically the software Wavestation and MS20, and confirming that they really are remarkably accurate recreations of the original instruments. So here we are, ready to put the final elements of the Collection through the SOS mill. Will Legacy Polysix live up the promise of the other components, and will Legacy Cell and its effects deliver what is claimed of them? I discussed how to load and authorise the Collection in the previous parts of this review, so I'll start by assuming that you have the software installed and running. On launching Legacy Polysix, the first thing you'll see is the Play screen (shown opposite), a fixed-size representation of the original synth. However, this is not where the real action happens, and you'll probably want to jump immediately to the Edit screen (shown overleaf), which contains all the original controls, plus the new ones that Korg have added for the Legacy Collection version. Even if you've never played a real Polysix, this is a simple and intuitive layout, and if you read my review of the Legacy MS20, you'll immediately recognise and understand the new controls that Korg have added to the original architecture. As on the original Polysix, Legacy Polysix 's oscillator section is simplicity itself, with three waveforms — sawtooth, pulse and pulse-width modulation (PWM) — three octaves, and a sub-oscillator. A sixth control, labelled Vibrato Intensity, controls the depth of pitch modulation imparted by MIDI continuous controller (CC) number one. Because MIDI hadn't yet been invented when the original Polysix was released in 1981, this wasn't present on the original, and the amount of modulation engendered by the Polysix's own modulation wheel was hard-wired. Nonetheless, the addition of this control in no way detracts from the original design. Likewise, adding a transposer of ±24 semitones, moving the bend intensity (up to one octave), and moving the fine-tune of ±1 semitone to the same area has no detrimental effect on the 'feel' of the synth. Testing with a signal analyser shows that the sawtooth wave produced by the original Polysix is surprisingly close to the ideal. This is relatively easy to model so, with the filter wide open, and no contouring or modulation, it's no surprise that the sawtooth waves from Legacy Polysix and the hardware original sound remarkably similar. The square wave on the Polysix is less ideal, exhibiting a significant overshoot on each transient, but the sound is still close to that of an ideal square, so the software and hardware incarnations again sound alike. In this case, it's necessary to close the filter of the original Polysix just a tad to match the brightness of the two instruments, but they then become almost indistinguishable. The PWM waveforms are also close to one another, although they require slightly different initial pulse-width settings to sound the same. Likewise, the sub-octaves have similar timbres, although the original Polysix's is again somewhat brighter. Overall, this is a very encouraging beginning. Is A Polyphonic MS A PS? Following last month's coverage of Legacy MS20, I was asked whether it sounds anything like its visually similar big brother, the Korg PS3200, seeing as Legacy MS20 is essentially a polyphonic MS20. I checked, and it doesn't. 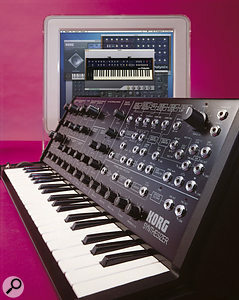 Although Korg originally released the PS3200 the same year, and the big polysynth shared much of its panel hardware and design philosophy with the MS20, it was a very different beast, with a single non-oscillating low-pass filter, pulse-width modulation of both oscillators, a graphic EQ, an ensemble unit, and many other voicing and control differences. These gave it a character that still sets it apart from other instruments. Even today, nothing else sounds quite like a PS3200. On the original Polysix, there are four filter controls: cutoff frequency, resonance, envelope generator intensity, and keyboard tracking amount. However, the actions of these knobs are highly sensitive to the settings of the synth's internal calibration trimmers. The tiniest error in any of these can produce the most amazing errors and inconsistencies in the front panel's operation. For example, adjusting the Keyboard Track trimmers incorrectly causes the Kbd Track knob on the front panel to add a variable delay before the filter Attack, rather than affecting the keyboard tracking itself. The Edit screen in Legacy Polysix. The Legacy Polysix 's filter has a wide range, with the cutoff ranging from 13Hz at the low end to 21.1kHz at the upper. And, with resonance turned to maximum, it produces a moderately pure sine wave, albeit with a moderate amount of contamination from the third and other odd harmonics. Given the sensitivity of the original synth's internal calibration, I had little confidence that my Polysix's filters would sound or respond in the same way as those of the software version. Yet when I compared the two, a remarkable thing happened... I found that the filters in the original synth vary from 15Hz at the low end to 21.1kHz at the upper and, with resonance turned to maximum, they produce a reasonably pure sine wave, albeit with a moderate amount of contamination from the third and other odd harmonics! In short, the only significant difference between the two incarnations is the amplitude of the self-oscillation when you raise their cutoff frequencies. On Legacy Polysix, this remains fairly constant, whereas on the hardware Polysix, the amplitude of the sine wave diminishes almost to nothing at high frequencies. This is possibly a characteristic not of the filter itself, but of a bandwidth limitation in the rest of the signal path. OK, so figures tell one story, but how do the filters sound? Remarkably, they're very similar, whether static or swept at various intensities. Sure, there are small differences, but with the resonance set to zero, I don't think that I could reliably identify which was which in a blind test. Amazing! Nonetheless, when you increase the resonance, greater differences become apparent, and when the filters start to self-oscillate, it becomes straightforward to tell the two synths apart. This is because Legacy Polysix 's filters track the keyboard linearly to the extent that, at 100 percent, you can play them just as you would another bank of oscillators. This feature, which became the norm in 1982 when Roland launched the Juno 6, was never a characteristic of the original Polysix, whose filter tracking is, at best, inconsistent. With careful programming, you can force the filters to lock to the oscillators, but you could never play them conventionally in isolation. Whether you view the differences between the original synth and the software as improvements or not is, I suspect, just a matter of taste. You can configure Legacy Cell (of which more later) so that the MS20iC controls either Synth1 or Synth2 directly (although not both simultaneously). More interestingly, you can direct the MIDI CCs output by the MS20iC's knobs to the virtual encoders and faders in the MIDI Controller section. You can then map any knob on the MS20iC to any assignable parameter within Legacy Cell. Neat. The next stage in the Polysix's signal path is the Attenuator, whose time-varying response can be set to a 'square' organ-type contour, or can be set to be affected by the instrument's single ADSR envelope generator (single per voice, that is). Again, these controls are echoed in the software version, as is the final volume control. The only concession to the 21st century is a pan pot that balances the relative amplitudes of the left and right outputs — the original Polysix was strictly single-channel. Naturally, the envelope times differ somewhat between the software and hardware versions, with the Decay and Release stages being slightly longer on the software, but the differences are no more than I would expect from tweaking those internal trimmers a tad. What's more, the curves sound similar, so Legacy Polysix 's envelopes — whether applied to the filter or amplifier sections — provide much the same response as those on the original. Legacy Polysix 's Modulation Generator and Arpeggiator sections (which can be seen in the Edit screen shown above) also echo what you'll find on the vintage synth, with a couple of extras; the Key Sync and Tempo functions that I described last month when I reviewed Legacy MS20. Despite the added complexity, I doubt that there's anything here that is anything less than intuitive so, finally, we come to the element of the Polysix that makes it the instrument that it is: the Effects section (shown in the centre of the Edit screen). The features new to Legacy Polysix.When the Polysix was released in 1981, it was the first true polysynth that was truly affordable. Everybody was impressed by its genuine VCO/VCF/VCA-per-note architecture, and the inclusion of bonuses such as chord memory, arpeggiator and unison. Nevertheless, it was the Polysix's amazing string and pad sounds that made us all sit up and take notice. In an era when many manufacturers believed that the inclusion of chorus and ensemble effects was 'cheating', the Polysix sounded fuller and richer than instruments costing many times its price. What's more, it did so with just one oscillator per voice, plus, of course, its revered phaser/chorus/ensemble, the last of which has since become an icon in synthesizer folklore. Indeed, this ensemble effect is so respected that a number of people have attempted to emulate it, while others have tried to add external signal inputs to turn their Polysixes into effects units. To sum up, good effects are essential on any emulation of the Polysix worth its salt. A few listens left me stunned. At any Speed/Intensity, the famous ensemble is recreated with remarkable accuracy, and its fat, swishy timbres pour forth. The phaser is not quite as accurate, lacking some of the depth of the Polysix's, and the chorus is perhaps the least accurate of the three. But for me at least, it's the ensemble that matters. 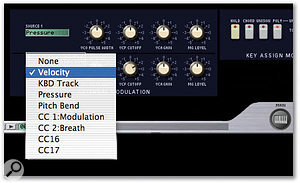 What's more, Legacy Polysix is a stereo synth, which explains the extra knob in the Effects section. Called 'Spread', this does exactly what you would expect, transmuting the original synth's monophonic effects into glorious stereo. Admittedly, this is very much an addition to the original instrument's spec, but who cares? It sounds gorgeous! Although I would not recommend using the MS20iC as a performance keyboard for Legacy Polysix (it's too spongy and unresponsive for that), it is nonetheless a useful programmer, because many of its knobs map to the Legacy Polysix equivalents. 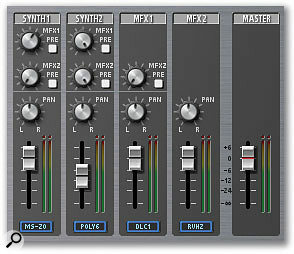 For example, the EG2 ADSR knobs on the MS20iC control the 'virtual' ADSR knobs on Polysix. Inevitably, there are others, such as the EG1 Attack and Release knobs, (which control Polysix 's Arpeggiator Range and Mode switches) that are less intuitive. 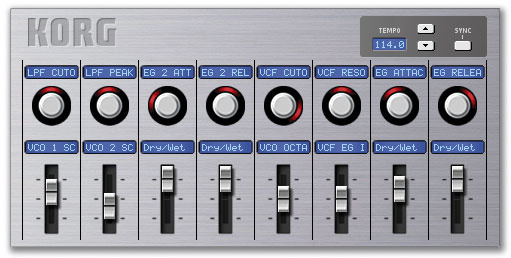 It would be nice if Korg were to offer a plastic overlay for the MS20iC's front panel showing the Legacy Polysix assignments. Hint. Hint! The lowest three panels on Legacy Polysix contain just four controls that were found on the original synth, whose functions are fairly self-explanatory: the on/off switches for Hold, Chord Memory, Unison (which stacked all six voices under a single key on the original) and Poly. Alongside them, you'll find Legacy Polysix 's polyphony selector (1 to 32 notes) the Unison selector (1 to 16 voices), the Unison detune, Unison spread, and 'Analog' random CV generator. The actions of each of these controls are identical to those found on the Legacy MS20 (with Unison taking the place of Legacy MS20 's Mono) so I'll direct you to last month's review for a description of each. Likewise, Legacy Polysix shares Legacy MS20 's external modulation philosophy, with two sources from a list of eight controlling a number of destinations, each with individual depths and polarities. The differences here are that Polysix has four destinations for each modulator (MS20 had five for each), and the destination list — VCO pulse width, VCF cutoff, VCA gain and MG level — is in keeping with the original Polysix's voice structure. As on Legacy MS20, you can use the Configuration page to select the modulators that will be received and, again, you can also ask Legacy Polysix to learn new MIDI controller assignments, using the menu hidden under the Korg logo to display, save and load the maps you create. Happily, Legacy Polysix is less power-hungry than Legacy MS20, and I was able to use its full 32-note polyphony and eight-voice Unison without CPU problems. At this point, my computer was using about 60 percent of its available CPU power, but this was while really pushing things to the limit. And even while I was trying hard to get the stand-alone Legacy Polysix to trip over, I was unable to induce anything remotely resembling a crash. Backing things off to a more sensible level, I tried using Legacy Polysix as I would the original. I found that it could be indistinguishable from the hardware version, from the oscillator at the start of the signal path to the effects section at the end. So, for the third month running, I must compliment Korg's engineers on the accuracy of their work. What's more, being accurate to the original is a compliment in itself because, despite its simplicity, the Polysix has bucketfuls of character. It can be deceptively smooth or surprisingly gritty and, whether you're using the original or the soft incarnation, you can obtain all the conventional single-oscillator sounds — imitative and electronic — with minimum effort. If you need a helping hand, the documentation is again first-class, and, as a bonus, the original Polysix manual and sound charts are provided as PDFs on the installer CD. Nevertheless, it's when you step beyond the original Polysix's limitations that things really start to happen. Using Unison to layer two or more voices, spreading them in the stereo field, and adding (for example) velocity and pressure sensitivity makes this one of the most lush and expressive software synths I have yet heard. Add to this the benefit of accurate filter tracking and synchronisation with the outside world and (as long as you accept the limitations of the Polysix's original architecture) there's little left to criticise. Indeed, in addition to the sound quality, new flexibility and robust operation on offer, there are at least two additional reasons to be excited by Legacy Polysix. Firstly, the original synths are becoming unreliable, with many reaching the point at which we can do little more than make them comfortable and wait for the end to come. The main culprit for this is the backup battery; this leaks as it gets older, and the acid destroys the circuit board and any components in the vicinity. For obvious reasons, Legacy Polysix is immune to this, so you are not going to suffer the horror experienced by many Polysix owners when they find that the thing no longer works properly. Secondly, the sound generated by original Polysixes can be rather noisy, with a constant background hiss regardless of the settings apart from the attenuation and final output volume. For the worst cases, there is a fix for this, but it's a truly foolhardy procedure that involves making an earthed metal cage from metal foil and plastic kitchen wrap, and installing this inside the case. If you get this wrong, and the foil makes friends with the circuits — or, worse still, the power — you can do serious damage to the synth, your studio's fuses, or even your own chances of seeing another dawn. In contrast, Legacy Polysix is silent except when you want it to be otherwise. This is a huge improvement, because nobody can convince me that suffering unwanted noise enhances the 'analogue experience'. There's really only one criticism I can level against Legacy Polysix. In common with Legacy MS20, the stand-alone Polysix is always in Omni mode. Unless there's a good technological reason why this should be so, this is a silly oversight. Other than that, I love it! 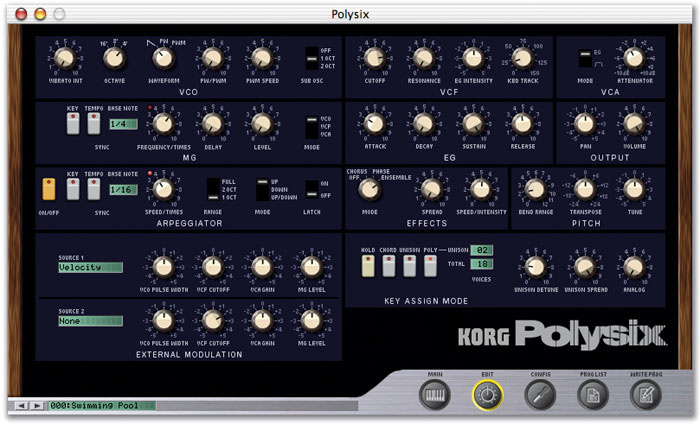 I may have finished talking about Polysix, but this is not the end of the goodies on offer, because Korg have written a conceptually simple but masterful 'wrapper' for MS20 and Polysix. 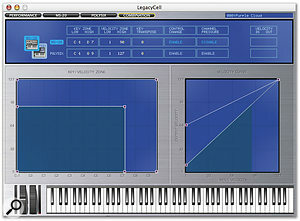 Called Legacy Cell, this allows you to play two synths simultaneously, offers the option of passing each through two powerful Insert effects, passes the results through dual Master effects, allows you to mix to taste, and finally presents the finished sound to the outside world. It's a powerful architecture which has graced many of Korg's best synths, so my expections were high. Legacy Cell's Performance Page. The bottom half of Legacy Polysix running under Legacy Cell, with its associated insert effects visible. When you start up Legacy Cell, you're presented with the Performance page (above). Ignoring the on-screen keyboard and control wheels, this is divided into six sections. At the top, four buttons allow you to navigate through the four major pages of the package. Below these, you'll find one of the four lists that display the 128 Performances in the currently loaded bank, the 'Preview' button, and the buttons that provide access to the Save/Load menus, and so on. Moving a Performance within a list is simplicity itself; you simply drag it and drop it in a new location, at which point the two will swap. If you want to duplicate a Performance, press the Option key, and you overwrite the new location. Simple! The 'Connection Area' in Legacy Cell.To the right of the Performance list lies the configuration or 'Connection Area', and this is where the fun begins. As you can see, this comprises two signal paths linked by a 'Combination' box. Korg calls the upper path Synth1, and the lower path Synth2, and each can contain either a Polysix or an MS20, or neither. This means that at any time, you can be programming and playing two polyphonic MS20 s, two Polysix es, or one of each, or nothing. In the example shown opposite, there's an MS20 inserted in Synth1, and the number in the box is the user-defined MIDI channel to which it will respond. 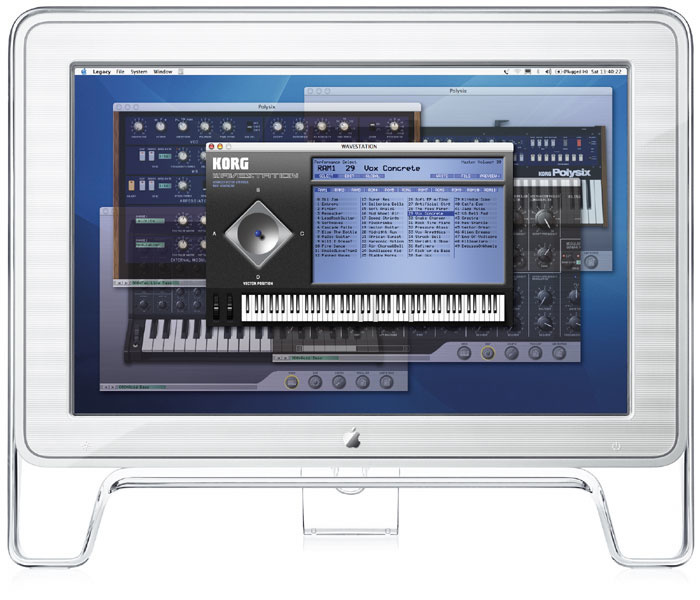 If you click on this box or the 'Insert FX' box to its immediate right, you'll be taken to a window that contains the software synth plus the two Insert effects associated with it. 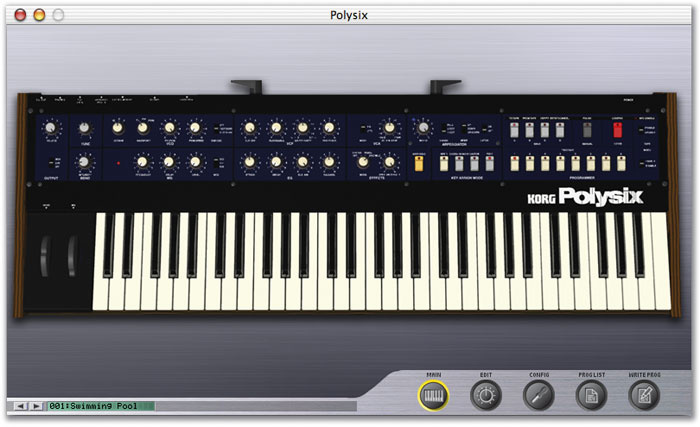 Likewise, if you click on the instance of Polysix in Synth2 or its associated Insert effects box, you'll be taken to an enhanced Polysix, as shown in the top screenshot above. Legacy Cell's Combination Page.Depending upon the power of your host computer, you'll want to keep an eye on the CPU load meter in the Connection Area. This lets you know if you're running out of power, giving you a visual indication of why something suddenly sounds so bad, or why (if you've set Auto Stop) everything has gone silent. If you're running Legacy Cell as a plug-in and the CPU load display doesn't appear, don't be alarmed. It seems that it only emerges when you run the package in stand-alone mode. Having chosen which synths you're going to use, you can determine which does what and when by clicking on the Combination button at the top of the screen, or the Combination box in the Connection Area. This takes you to the other screen shown on the previous page. The left-hand graph allows you to adjust the range of keys and velocities to which each synth will respond, thus allowing you to create splits and layers. 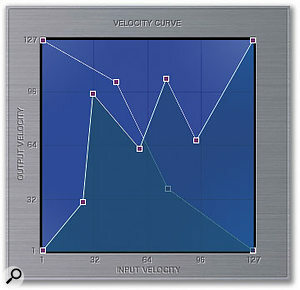 Simultaneously, the right-hand graph lets you see and adjust a velocity 'curve' for each. The screenshot above demonstrates that you can add 'handles' to each synth's response curve, and create responses that are as wacky or complex as you wish. When used creatively with the External Modulation sections in the synths, the results can be extremely impressive. 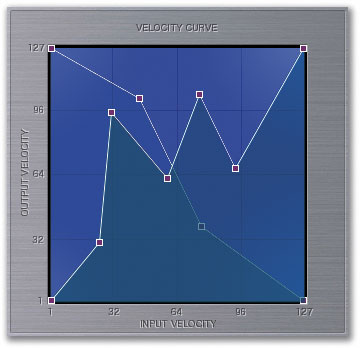 Creating complex (and silly) velocity curves. 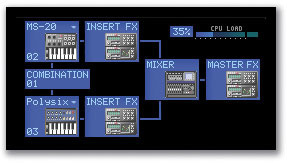 Above these graphics, the upper window in the Combination page reports the Combi settings for both synths, and adds transpose, continuous controller on/off and aftertouch on/off controls, all of which you can alter by clicking and dragging, typing new values, or toggling, as appropriate. It's neat, simple, and very intuitive to use. The Combination box in the Connection Area has its own MIDI channel, and data received on this channel is interpreted by the Combination page and directed to both Synths and their associated effects. In contrast, data received on a Synth's individual channel will not be interpreted by the Combination settings, and will affect that instrument alone. If you want to see which synths you have selected as Synth1 and Synth2 within Legacy Cell, the polyphony and voice mode, the insert effects used on each, and the master effects applied, you can do so by clicking on the Info tab below the Performance list. This gives you an overview of the complete Performance, and collects useful information that is otherwise spread over the other three pages. 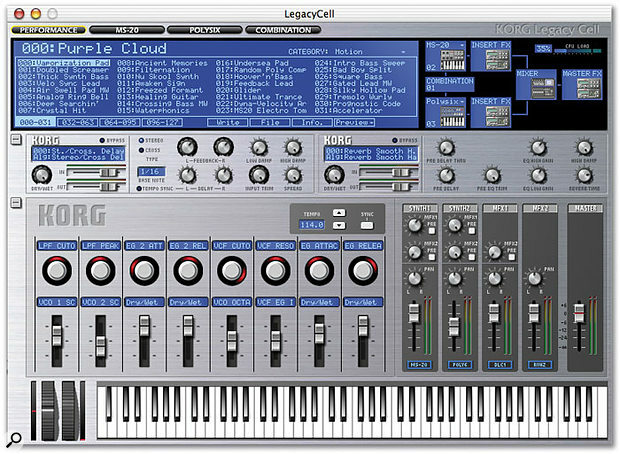 Many readers will notice the similarity between Legacy Cell 's Controller section (shown on the far right of the next page) and the Korg Microkontrol keyboard. This is no coincidence — in addition to its capabilities as a general controller, the Microkontrol also has a 'Korg Native Mode' that allows it to function as a dedicated SysEx controller for Legacy Cell. To this end, Korg have included a number of templates on the Legacy Collection CD, each of which includes a set of assignments for the controllers. To enable Native Mode, you have to change the MIDI In Device to 'Exclusive' in Legacy Cell 's Preferences (this isn't mentioned in either the Legacy or Microkontrol manuals, and took me ages to work out) but having done so, you can use the Microkontrol alongside other MIDI and USB controllers. To be honest, Native Mode seems to me to be a bit of an afterthought, and confers no special abilities that I can see. What's more, it doesn't work when you're running Legacy Cell as a plug-in, only when running it as a stand-alone application. Perhaps when Korg have had time to develop it further and extend it to other products, we'll see what they hope to achieve with it. Now let's turn to the Insert effects themselves. While these appear to be contained in the synth pages, they are only displayed there. Their values are actually stored in the Performance, so you can change patches, or even change synths, without affecting them. This is neat, because it emulates what would happen if you plugged your hardware synths into external effects units or stomp boxes. There are 19 algorithms (detailed in the table below) and you can select any of them for each of the two slots provided in each Synth. These slots are in series, and there is no option to reconfigure them for parallel operation. The screenshot shows the menu that appears for FX slot '1' on the instance of Legacy MS20 inserted in Synth1. Selecting insert effects. Once you have chosen the algorithm(s) you want, you can edit them using their knobs and switches or, in the case of '4-band EQ', you can modify the curve by grabbing and dragging the handles on the display itself. Each effect offers a Wet/Dry ratio, plus input and output level controls, as well as a Bypass switch. The effects themselves are more complex than their descriptions might suggest. Firstly, those with LFOs and other clocks offer external sync. Secondly, all of them offer dynamic modulation, which allows you to use the MIDI message(s) of your choice to alter the values of some of their parameters. These are excellent facilities. As usual within the Legacy Collection, housekeeping duties are performed by a menu tucked away behind the Korg logo. This allows you to display the existing effects program list, determine the dynamic modulation controllers and their polarities, copy and paste programs, write individual programs, and save and load them individually or in complete banks of 128. Strangely, it was while experimenting with the Insert effects that I suffered my only experiences of the Legacy Collection crashing. Admittedly, these were not normal conditions, because I was selecting one, and then another, and another, and another... but the crashes were repeatable, which suggests that there is a minor bug here. Having said that, I suspect that the majority of users will never encounter it, because what I was doing was not something that a user would normally do. Incidentally, once you've loaded the Legacy Collection, an additional option appears in the plug-in lists of your VST and/or AU-compatible host programs. Called MDE X, this contains all 19 of the effects algorithms, which you can run as VST and/or AU plug-ins at sample rates of up to 192kHz. You can use each of these exactly as you would within Legacy Cell, including the dynamic modulation features. '4-band EQ' (EQ4) A stereo parametric EQ. 'Compressor' (CP1) A stereo compressor with a multi-mode filter in the side-chain. 'Decimator' (DCM1) Lowers the sampling frequency and/or bit depth for lo-fi effects. 'DynaCompressor' (DNC1) A true stereo compressor, with linkable channels. 'Flanger' (FL1) A stereo flanger. 'LCR BPM Delay' (DLB1) A left/centre/right clock-sync'able delay. 'Mastering Limiter' (ML1) A simple limiter with auto make-up gain. 'Multi-band Limiter' (MBL1) A stereo three-band limiter. 'Multitap Chorus/Delay' (DLM1) This one's self-explanatory. 'OverDrive/Hi Gain + Wah' (ODW1) Distortion, plus a three-band parametric EQ, wah, and amp simulator. 'Phaser' (PS1) A stereo phaser. 'Polysix Ensemble' (PES1) The Polysix ensemble. Hurrah! 'Reverb Dry Plate' (RVP2) A dry-sounding plate. 'Reverb Hall' (RVH1) A medium-sized hall reverb. 'Reverb Smooth Hall' (RVH2) A large hall reverb. 'Reverb Wet Plate' (RVP1) A dense-sounding plate reverb. 'Stereo/Cross Delay' (DLC1) A stereo and 'ping-pong' delay unit. 'Talking Modulator' (TM1) Applies a vocal character to the input signal. The sounds generated by your synths and Insert effects now pass to the Mixer in the Performance page (shown on the left). 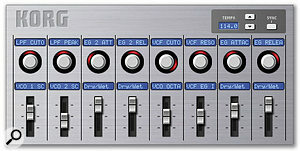 This provides Level, Pan and Mute controls, a master fader, metering and, on the Synth1 and Synth2 channels, pre-fader and post-fader sends to the dual Master Effects (MFX1 and MFX2, shown above). These are identical in form and function to the Insert Effects, with one important distinction: this is the place that you can invoke them in parallel. The MIDI Controller section (right) is the last piece in the jigsaw. This comprises eight 'virtual' encoders and eight faders to which you can assign either a MIDI CC (continuous controller), or a destination in one of the synths, the effects or the mixer. The MIDI controller section.Assigning the CCs could not be simpler: you simply choose from a pop-up menu, or have the software 'Learn' the next CC received. The only limitation is that you can only assign a given CC once. Likewise, if you hold down the Control key and click on the text window associated with a control, you can assign that control (and therefore its associated CC) to any one of the parameters in any of the controllable parts of Legacy Cell. As elsewhere in the Legacy Collection, clicking on the Korg logo lets you save and load your changes. The menu thus revealed also lets you edit your controller map directly, connecting MIDI CCs to parameters. This is by far the clearest way to create a map. The Tempo controller is the final element in the MIDI Controller section, and allows you to set clock tempos from 20bpm to 300bpm in intervals of 0.1bpm, which should be accurate enough for anybody. You can sync the synths' modulation generators and arpeggiators to this, as well as the timing controls of many of the effects. Alternatively, press the Sync button, and (when run as a stand-alone program) Legacy Cell will synchronise with an external MIDI device or (when run as a plug-in) to the host program. Waveforms: Sawtooth, pulse (50-100 percent), Pulse-width modulation. Sub-oscillator: -1 octave, -2 octaves. Number of effect types: 19. Number of audio channels: Two-channel input, two-channel output. Number of Insert effects: Four (two per Synth). Number of Master effects slots: Two. Number of real-time controllers: 16 (eight faders and eight rotary encoders). Formats: Audio Units and VST (Legacy Cell and Polysix), or stand-alone (Legacy Cell, Polysix, and MDE X). No MAS. 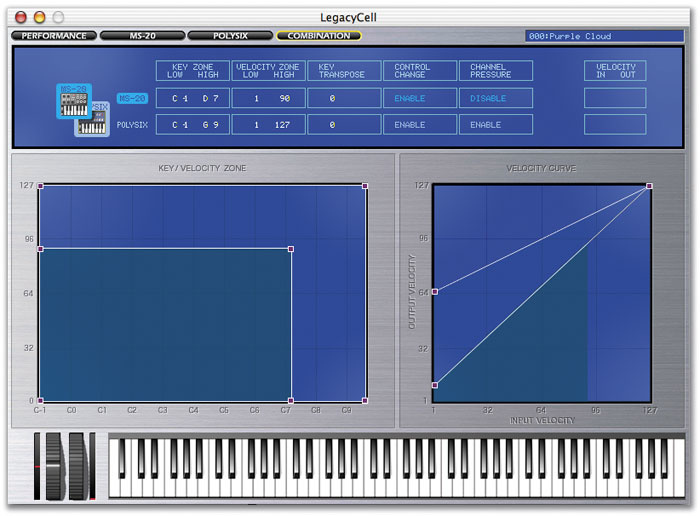 Legacy Cell is not hard to use, and once you've spent an hour or two creating and mucking around with a couple of Performances, you'll be combining synths and shoving the results through both the Insert and Master effects like a professional. And don't be in any doubt that you'll want to use it — you will. Why? Because the sound of two polyphonic MS20s, two Polysixes, or an MS20 and a Polysix, both with unison, detune and spread, and both affected by four digital effects units, is simply stunning! Legacy Cell's mixer.As for the effects themselves, they may not be the most sophisticated algorithms you have ever heard, but they are perfectly adequate. Some, like the 'Overdrive/Wah' and 'Talking Modulator', stand out as creative tools, although I would leave serious recording and mastering duties to somewhat more sophisticated products. And then there's the Controller section. 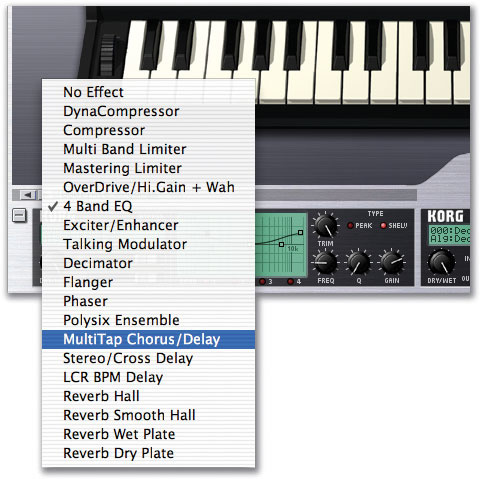 The flexibility afforded by this is enormous, and although I'm not convinced by Korg Native Mode (see the box on using Legacy Cell and the Korg Microkontrol earlier in this article), conventional use allows you to control almost anything in Legacy Cell using almost anything that can send a MIDI signal. So, given this eulogy, is there a downside to Legacy Cell? Actually, there are two, although I must admit that the first is relatively minor: there's no Leslie in the list of effects algorithms. Rotary speakers are not used solely for organ patches, and Korg is the master of the low-cost Leslie effect, so I can't imagine why this has been omitted. More significantly, there's the continuing question of CPU power; my 1GHz Mac struggled with some of the Legacy Cell Performances I threw at it, despite being above the minimum spec required (see below). Computer geeks will have no problem with this, but many small studios and less affluent musicians simply can't rush out to buy the latest computers. Fortunately for Korg (and for many other potential customers) the Legacy Collection seems to be better optimised for the PC, requiring a relatively modest 1.5GHz P4. Nonetheless, using nearly 100 percent of the power of a 1.5GHz PC is still no mean trick! While the original MS20 and Polysix architectures were very different, much is common to the two synthesizers in their 'soft' incarnations, and to Legacy Cell. This includes the methods of editing, the naming and writing of patches, and the saving and loading of patches and banks. Likewise, the Preferences are common to all, as are the synths' Configuration pages, with Legacy Polysix and Legacy MS20 sharing the same continuous-controller selection, MIDI-filter, tuning and temperament controls. Also common to both synths are Korg's claims for their Component Modelling Technology. I made my views on this clear last month, so I'll say no more about it here! Two months ago, you might have wondered why we chose to spread the full review of the Legacy Collection over three issues of SOS. I hope that this is now obvious; if any manufacturer had chosen to release any one of the three synths in this package as a discrete product, it would have deserved a dedicated review. What's more, Legacy Wavestation, MS20 and Polysix are not simply pages in a single, larger package; each is independent of the others, and can be used as a stand-alone product. Photo: Mark EwingWhen you look at the Legacy Collection in this way, it becomes clear what remarkable value it is. In the previous parts of this review, I've already suggested that both the Wavestation and MS20/MS20iC package could have been sold for £399 each. In fairness, I can't say the same about Legacy Polysix, which probably belongs with the general mass of software synths costing £100 or thereabouts — but when it's used within Legacy Cell and with the effects, the results are superior to those obtained from some virtual-analogue synths costing far more than £399. So let's be clear — the Legacy Collection as a whole offers superb value for money. Of course, there's no reason why Korg's engineers should stop at three synths, and it's fun to speculate about what they may be planning for us. What do you fancy? Legacy MonoPoly? Legacy EX800? Legacy MiniKorg700S (oh, yes please!) Or even Legacy DW8000? I certainly hope so, because Korg have proved that they can write near faultless software synths. But, returning to the current offerings, you may also wonder why Korg haven't offered two versions of the Legacy Collection; one including the MS20iC, and one — much cheaper, of course — without. I suspect that this has something to do with piracy. By attaching the Collection to a piece of hardware, whether necessary for use or not, the company has made pirated copies much less attractive. "Well done", I say. In fact, I would go further and suggest that Korg have missed an important trick here. It would have taken little extra work to turn the MS20iC into a dongle, and I suggest that it would have been well worth the additional development. Anything that helps stem the tide of piracy is a good thing, in my opinion. Operationally, there's little to say about the Legacy Collection except that the whole thing works. While this might seem a strange statement, it is my experience that most software does not work. Well... not 100-percent reliably, anyway. In contrast, every element of the Legacy Collection loaded without hassle, was quickly and easily configured, and then (with the exception of the Insert effects) ran for three months without crashing or causing any other problems. This is no minor accolade. So... the Legacy Collection sounds stunning, works almost faultlessly, has the 'wow' factor courtesy of the MS20iC controller, is superb value, and might be the framework of even more goodies to come. To be honest, I could write another few thousand words extolling its virtues, but after three months, I think that one will suffice: Excellent! Another remarkable recreation of a classic Korg synth. It's even better when you use the new facilities. I experienced not a single crash in over two months of use. The stand-alone version is always in Omni Mode. Korg have done it again! Legacy Polysix is a remarkably accurate recreation of the Polysix, and adds enough new features to turn it into a new instrument without sacrificing the sound and feel of the original. Although not the most powerful software synth in the playground, it has warmth and character, and should become very popular with players who appreciate analogue synthesis. A powerful Combi architecture for the Legacy Polysix and Legacy MS20 software synths. It includes 19 highly useable effects algorithms. 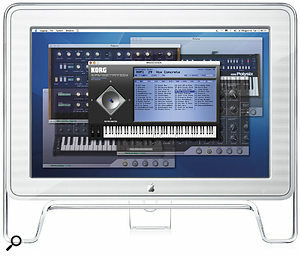 It offers powerful MIDI control and automation capabilities. It produces sounds to die for. It requires a powerful host computer. There's no rotary speaker effect. The excellent recreation of two analogue synths would have been enough, but in Legacy Cell, Korg have provided the type of 'partial' synthesis and Combi facilities normally found in digital workstations. The marriage of the two — classic analogue sounds plus up-to-date splits, layers, effects and automation — is made in heaven. Enjoy!